Named after a prominent civil rights activist and educational scholarship pioneer, the George I. Sanchez Collaborative Community School has a deep commitment to the growth and high achievement of every student. The first Albuquerque school to serve kindergarten through 8th grade, the Sanchez School promotes principles of critical thinking, innovation and collaboration. Another one of their core values is high expectations. Standard isn't good enough—and those expectations extend to their playground. With more than 1,200 children spanning a wide range of ages, interests and abilities, the school needed a play space with the capacity and durability to serve a large and growing student population with superior levels of engagement, challenge, and (lest we forget) fun. 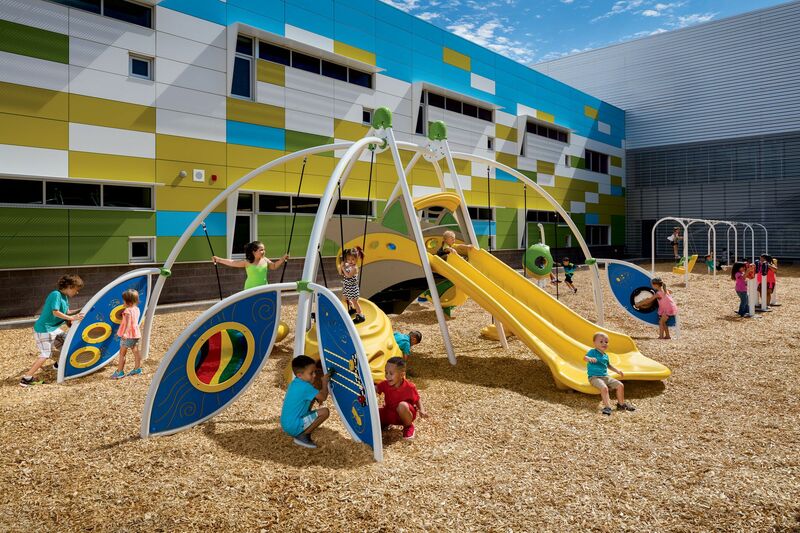 In the spirit of collaboration, Playworld worked with school leadership to formulate a playground with integrated play flow, yet with distinct areas and intuitive navigation to facilitate kids' access to age-appropriate play. A Bambino™ play structure provides pre-K children with physical and intellectual engagement specifically designed for little hands and hearts. For 5- to 12-year-olds, Adventure Series Climbers offer self-regulated challenge, confidence building and creative problem solving, and the Unity® Dome reinvents classic climbing dome play with innovative design. Its whimsical circles form asymmetric climbing paths for fresh mind and body challenge, and its more open layout invites kids to interact with each other while playing in, on and around. Meanwhile, ENERGI® fitness systems present the ideal activity for 7-8th graders who might feel too grown up for "little kid" playgrounds, but who nevertheless relish exercise and an outlet for their energy. Adding to the specialized play features, the Cozy Cocoon™ is more than just a fun motion experience—it also serves as a calming space for children on the autism spectrum to take a break from sensory input. Enjoyment and relaxation flow throughout the entire playground with features designed for all ages, such as the shade fabric that tempers the hot New Mexico sun, and the benches that provide a place to rest and recharge. In all, it's a perfect match—aesthetically, with designs crafted to complement the color palette and architecture of the school itself, and also philosophically—in the spirit of connecting with and challenging children, each at their own level, giving them the opportunity to wonder, engage, explore, achieve and enjoy.